Todd S. Purdum is the author of An Idea Whose Time Has Come and A Time of Our Choosing. He is a contributing editor at Vanity Fair and a senior writer at Politico, having previously worked at The New York Times for more than twenty years, where he served as White House correspondent, diplomatic correspondent, and Los Angeles bureau chief. A graduate of Princeton University, he lives in Los Angeles with his wife, Dee Dee Myers, and their two children, Kate and Stephen. 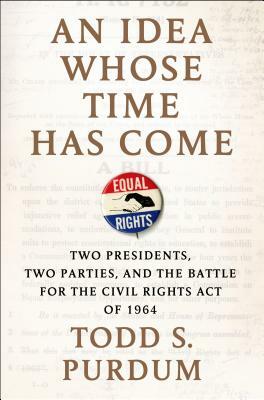 “In Todd Purdum's gripping account of the passage of the Civil Rights Act of 1964, we can see, from nearly every angle, how the federal government began making good on the ‘promissory note' of equal rights that Dr. King had invoked at the March on Washington. Purdum provides both an invaluable education in the political process and a keen understanding of how personalities (the famous and the unsung) and the best of both parties overcame every roadblock to ‘make real the promises of democracy,' as Dr. King had challenged.” —Henry Louis Gates, Jr.